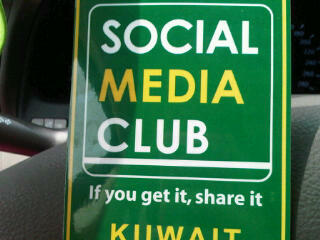 I just came from my first ever event with the Kuwaiti branch of the international “Social Media Club”. They were nice enough to invite us for breakfast. I got to meet a lot of exciting people there; like TV presenter Hessa Al-Mulla, Social Media Queen Hind Al-Naheth, and VIVA’s Head of Communications Ms. Sara. It’s nice to see people take social media professionally like this. I’ll have a more detailed post later on inshalla. Good luck guys, wishing you all the best inshalla.